Would you like to start a real business where you can realistically work the hours you want but still earn a fulltime income? Then you should seriously consider starting a wedding decorations business. 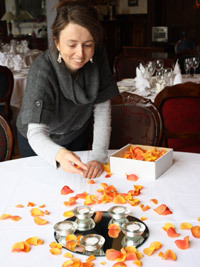 Hi, my name is Cindy and I have been decorating couple’s weddings for over 8 years. It is a great business to be in where I get to meet some wonderful people and get a great deal satisfaction from using my creative skills. But it wasn’t always like this. I’ve always had an artistic rather than an academic background. A natural choice for me was to become an Art teacher. I loved the creative side of the role teaching kids to express themselves. However, I hated the other side of the job which was dealing with office politics, completing loads of complicated paperwork and becoming frustrated how the organisation was being run. I worked my way up to being a Senior Teacher with management responsibilities – that only made things worse! In short, I wanted out. I needed to find a career where I could work for myself, use my creative skills and be in charge of my own time. After years of trying to find a new fulfilling career I finally hit on the market that I have now come to know and love – weddings. 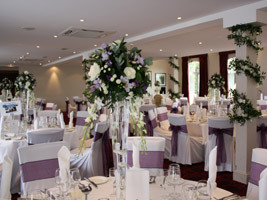 A wedding business ticks many of the boxes that people have when it comes to setting up a new business. And one of the biggest advantages of a wedding decorations business is that it is relatively easy to set up and get started taking orders right away. 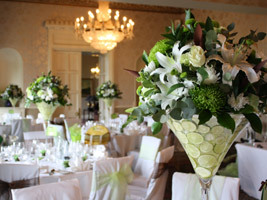 When I started working on weddings it was because I had studied floristry at college for a couple of years. But I have since made friends with a number of wedding decorations suppliers who have not had to spend time studying, they have simply set up their businesses and immediately started trading. Then it hit me…after looking at the profits from my business, 80-90% of the profits came from venue decorations rather than bouquets. I was in the wedding decorations business as well! 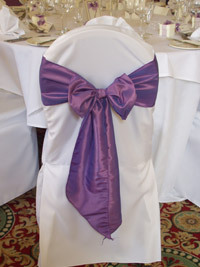 If I was starting out again, I would definitely be starting with a wedding decorations business. This gives the opportunity to offer brides services such as wedding chair covers, venue decorations, wedding table decorations and many more. All without the time and expense of spending years in college before you can start earning. 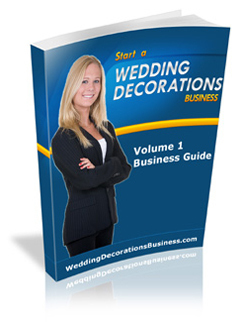 To help other people get into this exciting field, I have created a new package called “How to Start a Wedding Decorations Business”. It contains everything that you need to know about how to make this business a success. Having been through the process myself, and knowing the businesses of many of my friends, I’ve come to know first hand what works and what doesn’t. This guide shows you step-by-step what services you can offer to clients, and how to set up your business. 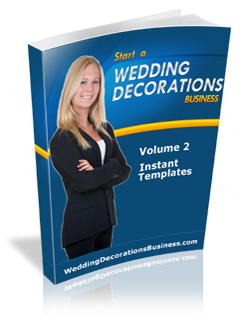 This is a detailed ebook explains how to set up your Wedding Decorations business without spending a huge amount of money. Included are my proven marketing plans for attracting brides and taking orders. This is all done without resorting to pushy ‘salesman tactics’. The pdf ebook format means that you can download the product instantly after purchase and read it on your computer. These are templates of some of the actual documents that I use in my own business to help me attract more clients and convert enquiries into actual jobs. These are simple to use and will save you a ton of time in setting up. There is no need to try and 're-invent the wheel'. these templates have worked incredibly well for my business and will help you get up and running quickly. There are suppliers for both the UK and US included. Also included is a list of resources that will help ensure that your new business runs smoothly. I still get a great sense of satisfaction when I get a ‘thankyou card’ or letter from a bride thanking me for making such a difference to their big day. It is a great feeling to be recognised for the effort that you have put in. This is a so different to when I was working a J.O.B. I now have the flexibility to plan my day how I want and I’m recognised as an expert in my field. Working in the wedding industry has really been life-changing for me. But what about you? Can you see how the benefits of this career could suit you? Maybe you are looking for a new career because you are facing redundancy. Or you are looking at earning a little extra money but don’t want the commitment of a second job. Or maybe you are looking for a sound long-term business that you can start slowly to ‘test-the water’ and gradually build up. How many other businesses allow you to enjoy yourself at the same time as helping other's dreams come true? So now you may be thinking what would be the cost of a package that could have such a profound effect on your life. The information in this package has come from over 8 years of working in the industry and finding out what works and what doesn’t. This package will allow you to get the shortcut to success and not make some of the early mistakes that I did. I could charge $97 for this information, but I want to make it as widely available as possible, and to gain some feedback and testimonials. For this reason I am initially making the product available for the low price of just $27. When you think about it, $27 is an absolute rock-bottom price for information that could change your life. Even if you were to go to evening classes to try and get similar information, it would cost you in the region of $200 - $600. With this package you get the convenience of being able to download it straight away and start reading about this exciting new career. I will be raising the price in future once I have gained some more testimonials, so if you want to secure your copy as the introductory price of $27, click on the 'Order Now' button below. You have a full 2 months (60 days) to go through the package and decide if you the Wedding Decorations business is for you. Download the materials to your computer. Read and discover the amazing opportunity that the wedding industry holds for you. If for any reason within those 60 days you aren’t totally satisfied, we’ll return every penny paid, no questions, no quibble. Try the package for yourself, take a full 60 days and if you’re not convinced that a my “Start a Wedding Decorations Business” package delivers everything that I have outlined here, just send us an email and get a full refund, no questions asked. Business Guide - Downloadable ebook in pdf format detailing how to set up your own successful Wedding Decorations business without spending a huge amount of money. Instant Templates – Time-saving templates that can be used to get your business up and running quickly. Resources File – Essential details of wholesalers and suppliers that will help you get your business off of the ground. There are suppliers for both the UK and US included. P.S: I will be raising the price of this package back to the normal price, as soon as I have sufficient testimonials. Why not take advantage of this lowest ever pricing?